Oh, but that's not all, folks! For the price of a single blog post, you get not one, but two misfortunes! Also this week, we lost a dear close friend - Mr. Water Heater. This knocked out water to the shower and the kitchen - not good, especially when my brother is coming to visit in just a few days. I'm happy to report that a crew was happy to come out, rip out our ceiling, and detach the broker appliance from the ceiling. THE CEILING. Who mounts a large water heater to the ceiling? As it turns out, they had to re-drill and remount the new water heater in the ceiling, then send out another crew to replace the ceiling (which was falling apart due to water damage), repatch, and repaint. At least they installed it over the tub, so as to catch all of the falling water and drywall. Nice planning, chief. 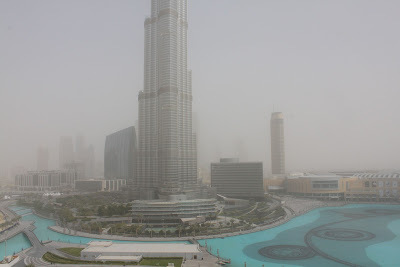 Stay tuned for hopefully positive news - in the meantime, we're staying in to watch movies and avoid the sandstorm!